During the Autumn, I tend to incorporate smoky eyes, dewy skin and a bright pop of colour into my daily make up routine. When it comes to Autumn party makeup I don't sway too much from this mantra either, except I usually opt for an extra dose of highlighter and a set of a false eyelashes. 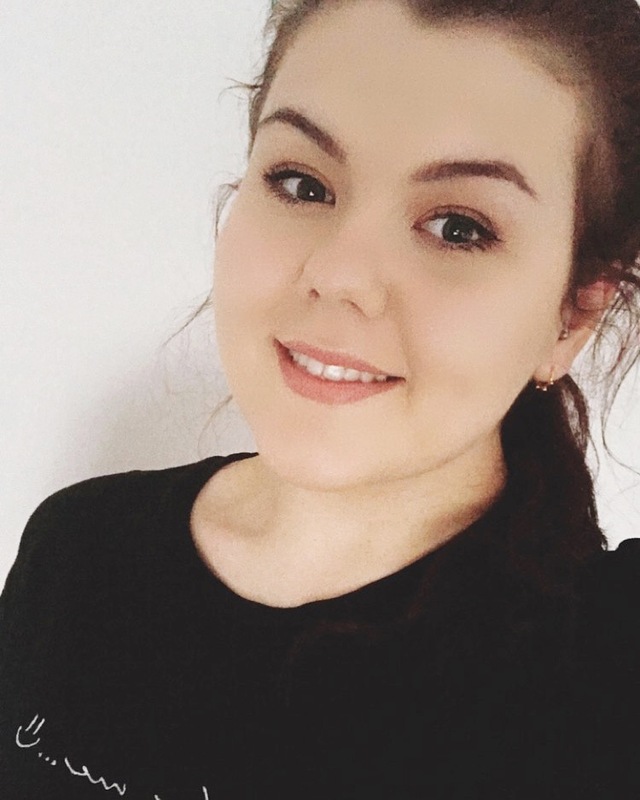 As tomorrow marks the day that I turn 19 years old, I thought I would share with you my typical Autumn Party Makeup look which I will be wearing on the special day. The colder weather often brings dull, lacklustre skin and as I like a fuller coverage foundation for a night out, the Charlotte Tilbury Magic Foundation offers a finish that is both flawless and brightening and can do no wrong. It's easy to blend, effortlessly conceals imperfections and evens out skin tone; perfect for those days when you want an immaculate base. With a lightweight texture that covers just about anything from scarring to redness this demi-matte foundation will leave you with perfected, pore-less skin all day long. After adding any necessary concealer and lightly applying loose powder to set my base, I move onto blusher where the H&M Pure Radiance Powder Blush in Golden Peach is on hand. This long lasting, coral hue adds a warm glow to the cheeks without being too overpowering. Next up is highlighter - whether I'm going on a date night or to a party, highlighter is a necessity for me. When I want a soft, radiant finish I dab the Topshop Glow Highligher in Polish over my cheekbones and finish with a dusting of The Balm's Mary Lou Manizer to emphasise on my contour. On my eyes, I have been reaching for the Urban Decay Naked Smoky Palette*. This palette has an array of shades ranging from rich browns to sultry purples, perfect for creating many versatile eye looks. I apply Dirtysweet all over the lid, accompanied by Radar lightly on the edge of the lid. On my crease I apply Whisky, a matte brown followed by Password, a cool taupe hue. Together they add definition, making for an easy to wear golden, neutral smoky eye look that goes with pretty much any outfit. I'm not a huge fan of a dramatic highlighter underneath my brow bone, so Thirteen is the perfect shade for me. Although it's a matte and wouldn't necessarily be considered as a highlighter at first glance, this white hue is perfect for when you want to accentuate sharp, defined eyebrows without going OTT. To follow I apply the Accessorize Eye Lover, a long lasting liquid eyeliner that defines your upper lash line in an instant. I used to use Accessorize all the time when I was younger and I'm sure some will remember the time when everyone went crazy for their highlighters. Fast forward a couple of years and Accessorize have relaunched their make up range, so I knew that I had to get my hands on a few items. Despite their nail polishes getting all of the heart eye emojis with their unique bottle shape and rose gold detailing, it was actually their eyeliner that stole my heart. With a highly pigmented formula, matte black shade and precise, felt tip applicator, this eyeliner is one of the best I've tried. Without even mentioning how pretty the rose gold packaging is, the eyeliner itself is fantastic for those that haven't quite mastered the art of eyeliner yet. Although I'm somebody who swears by the phrase "practice makes perfect" when it comes to those eyeliner flicks, this really does make an incredible difference to how fast and effective you can create your specific eye look. It's ideal for all occasions, whether you're opting for a thin, subtle line or a thick, dramatic line. When it comes to party make up, I want something that'll last and I find that it is my eyeliner that is first to look worse for wear, but not with this. It will give an all night look without smudging or budging - Perfect. After curling my lashes and several lashings of mascara, I apply my Eylure False Lashes - 101 to add a bit more volume to my lashes and intensify the overall look. I have used these lashes for many years now and they're my go-to for any party or date night look. Although during the Autumn, I tend to opt for berry and deep red hues to stain my lips, I have been enjoying wearing a bright coral to freshen up my complexion. If you're looking to go dark then I would recommend MAC - Ruby Woo as it's extremely long wearing and it goes effortlessly with any outfit. If you're like me and you still can't seem to let go of those coral offerings, then the Nars Satin Lip Pencil in Lodhi is a must have. Although Lodhi is bordering on being more of an orange hue, I still find that it's easy to wear. It sits comfortable on the lips, wears well throughout the day and is easy to reapply throughout the night. To finish, a party makeup look wouldn't be complete without a wash of colour on your nails and when it comes to nail polish, no one does it better than Essie. The two shades I have chosen are Fifth Avenue, a statement glossy red-orange and Summit Of Style, a golden glitter that gets brought out every time I have an event to go to and one that continues to add a luxe effect to the nails. 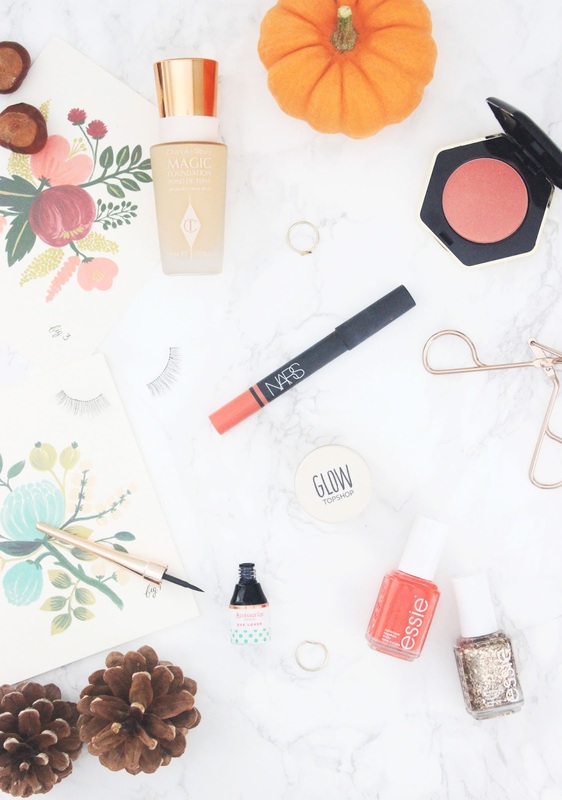 What are your Autumn party makeup staples?